Court with stupa, after excavation, Ali Masjid. bl.uk > Online Gallery Home	> Online exhibitions	> Asia, Pacific and Africa Collections	> Court with stupa, after excavation, Ali Masjid. 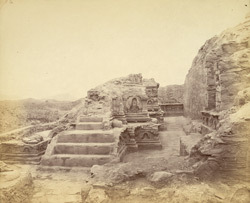 This photograph of a court with stupa was taken by Joseph David Beglar between 1878 and 1879; it forms part of the Archaeological Survey of India Collections (Indian Museum Series). This photograph shows the ruined courtyard around a Buddhist stupa near Ali Masjid at the head of the Khyber Pass in the North-West Frontier Province, Pakistan. A stupa is a hemispherical monument which would have formed the focus of worship at Buddhist religious sites such as Ali Masjid. This photograph shows the site of a stupa after excavation. It illustrates the type of context from which many of the sculptures photographed as part of these collections came from.